Although New York City was damp, the heat inside the U.S. Rumble sound clash was scorching. The prime Irish and Chin-staged sound clash competition, which saw some of America’s most promising sounds compete for the national title and prized spot on the World Clash stage, took place before diehard clash fans and critics on Saturday, April 22. Edging out all competition and upstaging most of the predictions, the awesomely talented Platinum Kids (made up of brothers Marcus and Paul Gavin) won the U.S. Rumble, defying the theory that a juggling sound has no place in the clash arena. Without a doubt, the intense U.S. Rumble brought the rich Jamaican music art form of sound clash to life, offering patrons an authentic experience. 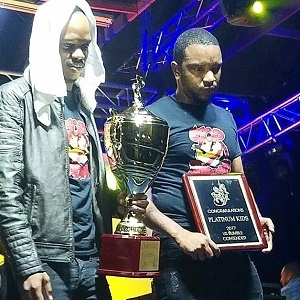 The exciting U.S. Rumble sound clash featured a cohort of talented sounds including the defending champion Innocent (Florida), King Shine (New Jersey), One A Day (New Jersey), Riddim Force (Florida), Kosmik (New York), Black Magic (Georgia) and Platinum Kids (New York). With the odds stacked against them, Platinum Kids entered the U.S. Rumble stage ready for warrrr from round 1. Billed as the “under dog” and the “wild card” in the month’s leading up to the event, Platinum Kids were thrusted into opposition with the entire line-up of highly skilled traditional clash sounds. As a result, the sound came to show and prove their strength to all their competitors one by one. Through targeted speeches and a mixture of 45s and dubs, brothers Marcus and Paul Gavin made their mark. Most of the sounds came in strong during round 1 with King Shine, who played last, being a top pick early on by many in attendance. King Shine’s past U.S. Rumble performance, recent victories and international sightings certainly brought forth a buzz for the sound. Lasting more than an hour, the initial round was full of steady musical entertainment. Some verbal attacks ensued, but the majority took flight later in the night. the interest of the crowd. While Platinum Kids homage to Bronx selectors and sounds, proper music introductions and overall energy connected with the audience, One A Day, Riddim Force and Black Magic captured attention with fiery speeches and equally potent dubs and 45s. U.S.Rumble's elimination rounds saw Kosmik, King Shine, Riddim Force and One-A-Day being sent home prematurely. Kosmik's exit may have been influenced by their introduction of a new member, who the audience wasn't familiar with. In spite of both King Shine and Innocent having an arsenal of music, they struggled to wow the New York audience, which many consider some of the arena's toughest judges. Additionally, defending champs Innocent had a different team competing than the one at their U.S. Rumble debut, which gave them a slight disadvantage. Regardless of elimination, Riddim Force had a rather steady performance, scoring intermittent forwards and launching never ceasing verbal attacks on Innocent. One-A-Day was looking like a top contender, but dropping Marcia's Griffith's "Electric Boogie" during an intense round killed their running. With only Platinum Kids and Black Magic remaining in the clash, the final segment boiled down to a memorable tune-fi-tune. The audience swayed during the tune-fi-tune, leaving a feeling of suspense and anxiety in the atmosphere because one genuinely couldn't predict what was next. At one point the score was tied 4 to 4. But Platinum Kids went with their gut feeling, dropping two powerhouse selections -- Carl Dawkins' “Satisfaction” and Mighty Diamonds' “I Need A Roof” -- that with the proper speeches they knew couldn’t loose. Despite Black Magic’s loss, they proved that they will be a name we see quite often in this arena. Platinum Kids are no newcomers to sound system entertainment. Arriving in Bronx, New York from Mandeville, Jamaica more than 20 years ago, they were heavily influenced by sound clash, often prompting them to trade clash cassettes with their friends as children. The sound plays out several days a week, allowing them to steadily build their fan base. With several marquee events staged a year and a popular weekly radio show, Platinum Kids has made a name for themselves in New York and beyond. Their U.S. Rumble victory and addition to the sound clash arena, which is truly a win for all, will further highlight their talent and brand. Irish and Chin’s U.S. Rumble is a part of their Rumble Series, which is designed to bring new sound system stars into the sound clash arena. Through Rumble clashes in numerous territories winners go on to represent their countries and perform at the famed World Clash. With three Rumble clashes being staged this cycle, including U.S. Rumble (Platinum Kids), Japan Rumble (Fujiyama) and Canada Rumble (King Attarney), remaining are U.K. Rumble on June 17 and Euro Rumble on June 24. A Caribbean Rumble is also in the works. The winners of all Rumble events will compete at World Clash in October 2017.